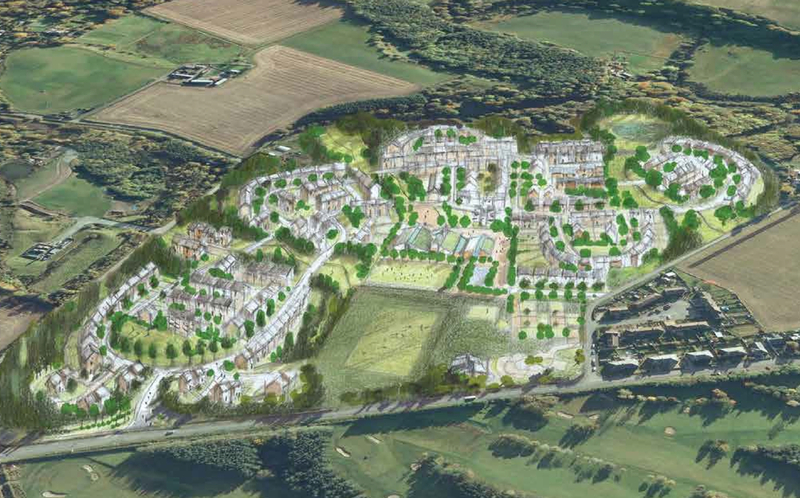 Today, with a population thought to be around 18,000 people, Penicuik can still be classed as Midlothian’s largest town but an inundation of new housing developments will make sure that the this title is set in cement. It is land you may walk your dog on, or ride your bike, however you shouldn’t be misled, the land in the north west of Penicuik is not safeguarded green land. No, it is quite the opposite. These many hectares of undeveloped land are in fact housing sites in waiting. Allocated as such in the last Midlothian Local Development Plan, the plots of land north of Rullion Road, east and north of Deanburn and north of Greenlaw Mains, are eager to be excavated and built upon. Below we look at when the developments will materialise (if ever), who will be doing the developing and what will be built, in terms of housing numbers and other facilities. We will also look into the housing sites that didn’t quite make the cut, at least not yet. So sit back and prepare yourself to witness the twenty-first century expansion of the humble burgh of Penicuik. Midlothian Council are currently constructing their latest batch of social housing. These developments are due to complete between March and May 2015. The most notable development is 52 John Street. This is a development of flatted dwellings which will fill the gap site where the Jackson Street Primary School used to be. Taylor Wimpey are the first developer to seize the moment to build in Penicuik, or at least they would be if they could conclude their section 75 legal agreement with the council. With plans already granted for 458 dwellings (some of which are social/affordable) this development is the closest to fruition. Last February, Midlothian Council granted planning permission for Greenlaw Mill, which will be built on land north of Greenlaw Mains One. Border fencing was erected in the following August and works started clearing the land. Two weeks later works were stopped, the site cleared and to this day (June 26) there is still no sight of the elusive developer. Midlothian Council told us two months ago that the developer contributions to the local infrastructure and education sector would be agreed on in June. Now with several days remaining, we have been informed that a July/August signing date is forecast. What: 458 dwellings, including three apartment blocks, around 24 social/affordable homes and associated landscaping with a five aside football pitch and play park. A commercial zone is also planned but is subject to an additional planning application. It would feature a convenience store, creche and other units. Details of this development remain elusive. Previously under the ownership of Mactaggart and Mickel, the land north of the planned Taylor Wimpey Greenlaw Mill development, looked set to house a smaller development of larger properties. The site is now owned by a consortium of home builders, MacTaggart and Mickel, CALA & Bett Homes, the site could effectively host the same number of properties as Greenlaw Mill. However mine workings in places may narrow down the extent of the build. When: Plans are set to be resubmitted this year so likely start date Autumn 2015 at the earliest but more likely Spring/Summer 2016 going by the delays with Taylor Wimpey. H26 is a development site which has been under discussions since the 2004 local development plan (LDP). Back when the LDP was first published, Cala Homes automatically seized the opportunity and announced plans to build around 150 houses. The site is now owned by the homebuilders’ consortium. Going by the increase of dwellings on site H25 (Greenlaw Mill) since they were initially assessed back in 2005 (around 150 increase) it would seem realistic that we can expect Cala to also up the numbers in a reapplication. When: Like H16 Belwood, plans are due later this year, so Spring/Summer 2016 seems likely. This expanse of land stretches from Rullion Road to south of Mauricewood Stables. Now under the ownership of a consortium of three housing developers, Mactaggart & Mickel, Bett Homes and Cala, the development will be the largest development in Penicuik. Situated around a new link road connecting Mauricewood Road and Rullion Road, the new community will house up to 500 homes, a portion of which will be owned by Midlothian Council and rented out to tenants. Plans for this development are also due to be resubmitted by the year’s end, at least from Mactaggart & Mickel anyway. Who: MacTaggart and Mickel, CALA & Bett Homes. Midlothian Council will also develop homes in the west of the development. When: Considering the numerous developers, the site will likely be built in many phases probably from Summer 2016. You have now read about all the developments currently planned under the 2004 and 2008 local development plans. If you were not aware, Midlothian Council have just finished consulting on a new local development plan. The plan itself states that “limited further development should be permitted in Penicuik considering the already allocated developments” [sic]. However house builders are not amused by this and have submitted numerous requests to have extra land added to the local development plan. The proposed plan will be published later this Summer and will reveal whether the council have changed their minds. The first proposed site we’re going to cover is situated in Milton Bridge, Penicuik. The land is currently owned by the Ministry of Defence however they say that it is now surplus and they are looking to dispose of it. Going by the size of land, around fifty small homes could be built connecting to Belwood Crescent. Assuming the site would be incorporated in the next local development plan, any construction work would likely commence in 2017. Cala Homes have requested that the industrial warehouse at Pomathorn Mill be included in the forthcoming plan. They want to use the land to build approximately fifty homes, which they say, could be delivered easily within the next five years. However the building is occupied by a car valeting service and a car sales garage so the acquisition could enter a legal debate which may take some time to resolve. Miller Homes intend to continue their developing at Auchendinny by building hundreds of homes north of the town. Site A1 in the planned 2014 LDP would see the developer build many homes along with a community area and a primary school. Their plans are in a late stage and it seems like they are just awaiting the plan to be approved so that they can seek planning permission. It should be noted that a lot of Auchendinny residents are not in favour of the development. Should the plans be accepted expect development to be underway by 2016, after all Miller Homes have moved fairly quickly at Dalmore Mill. This is a surprise submission by the University of Edinburgh. The land which is part of their Bush estate, is now “surplus to requirements” and they believe it would be suitable for housing. As per the Miller Homes development at Auchendinny, the University have compiled an in depth report, including a transport assessment and a mineral and mining evaluation. The Uni and their planners think that 600 residential units could be built on the land. However, it is part of the Greenbelt currently and it could be controversial and may not pass through planning. If the site is included in the LDP, construction would probably start by 2018. The consortium behind H16 Rullion Road also want to extend this site to reach the A702. Their plans will likely be rejected however to keep a border of land between Penicuik and the trunk road. Further sites may also arise at Bush should the A701 road realignment go ahead as planned. As you can see, the land which many of us utilise daily for recreational activities will soon have a very different purpose, housing. Whilst a lot of the developments are speculative and may never materialise, a maximum of 2558 properties could be built within the next thirty years. Taking an average of three per house, that is a population boost of 7674 residents. It is clear that Penicuik is set to become a lot larger. Presumably the author of this article lives in a house which was built on unoccupied land – we all do. If these houses are not built where will people live? The demand for housing is increasing for many reasons – little to no council housing available, people who previously could not afford to buy are now in a position to do so, people are living longer which means that 2nd hand properties do not become available as often as before. New homes mean better facilities are provided and jobs are created & lets face it Penicuik could use a bit if an upgrade. Whilst I agree that the infrastructure needs to be able to support the new homes, I dislike this knee jerk reaction that it is automatically a bad thing to build new homes and does not show a welcoming attitude to new arrivals who will inject finance, ideas and enthusiasm into the area.